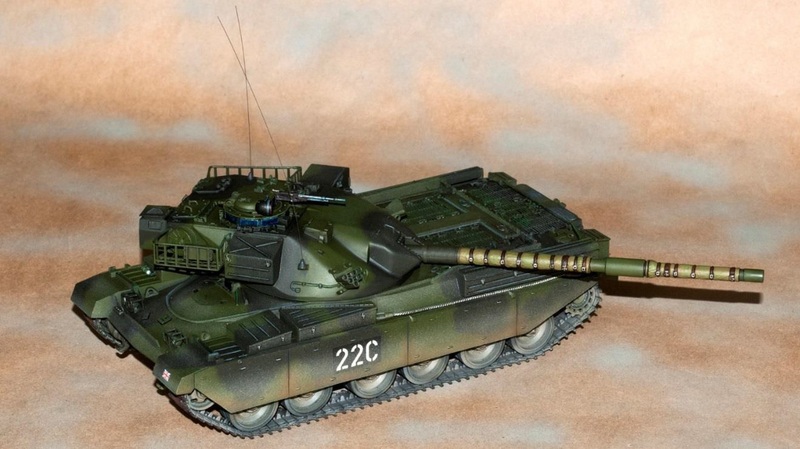 Here’s a quick build article on the Tamiya 1/35th scale British Army tank. The original release date of this kit was in November of 1975. Upon opening the box & inspecting the parts, one realizes that this is an older kit, as it has various characteristics that most static models wouldn’t presently have. As this was originally supposed to be a motorized model, there are large holes in the bottom of the two part hull. These were to accommodate the controls, & switches for this kit. Having those openings was added effort for sealing them up. The build is quite straight forward. I started by assembling the bottom half of the hull. First order of business was closing up the gaps in the bottom. This was done by first gluing a piece of plastic sheet into the bottom, overlapping the holes. This would give a base for the plugs to sit on. After this was secured, I then cut pieces to match the openings out of .040 Evergreen sheet stock. Any gaps around the edges were sealed up with super glue gel. Once all openings were sealed, the area was sanded smooth & blended in. The suspension was then attached to the corrected Hull, but needed some cleaning up to get rid of molding seams & injection marks. Next up came the cleaning up of the road wheels. All 24 of them! There was a radial seam running around the circumference of all the wheels, which needed some attention. To do this, I held each one tight through their centers, with a long machine screw that then acted like an arbor. I spun them in my lathe & and with a file & sanding sticks, did a smooth job of cleaning up the outer surfaces. Once assembled & painted, they were slid on the suspension. After that, it was basically follow the instructions for the rest of the building process. A few adjustments had to be made on a few parts of the kit. A gap over the rear drive sprocket cover had to be filled, and some blending in of the long cylindrical parts on top of the engine compartment. I also had to shorten the cables that rest on top of the fenders, as they’re too long & stick too far out the aft end if not trimmed. I left a few pieces off for painting, as it was easier to paint & Dulcoat/Gloss coat themseparately. Those being the front lights, light cages & what look to be small fire extinguishers attached to the fender boxes. Reason being that both the headlight lenses & the extinguishers are gloss. I did some minor research on this subject & found the patterns of the camouflage schemes were quite varied. No two tanks were painted in quite the same pattern. I used pictures from the internet to get a good idea of the colors, & the pattern I used was taken from the instruction sheet & box art. Almost all paints used were Testors Model Master colors. For the main body, I used a combination of Testors RAF Green for the lighter areas, & for the darker green I used the same color, but added approx. 50% of black to it. While it looks black, when seen in light, it shows as a Really Dark green. The outer circumference of the main road wheels were painted Floquil Grimy Grey. The tracks were painted steel, the gone over with mists of dark greys & dark browns. The view ports in the commanders hatch & drivers area was done with silver, followed by a translucent medium blue & finally a clear blue. The exhaust was painted steel & given a quick dry brushing of thinned black. Finally, the dust & grime on the side skirts & lower areas was a combination of Testors Radome Tan, Medium Grey & Floquil Dust. With it all finally set with a couple coats of Testors Dullcoat. 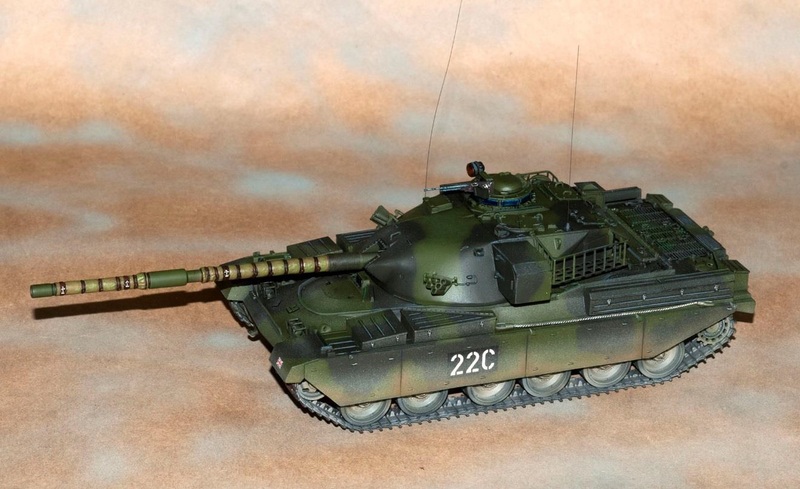 While the kit may be rather dated by today’s standards, it still builds up into a good representation of an early Mk.5 Chieftain Main Battle Tank. It assembles relatively easily & there were no major problems encountered. Which was good, as this was my first armor model I’ve built since my early teens. 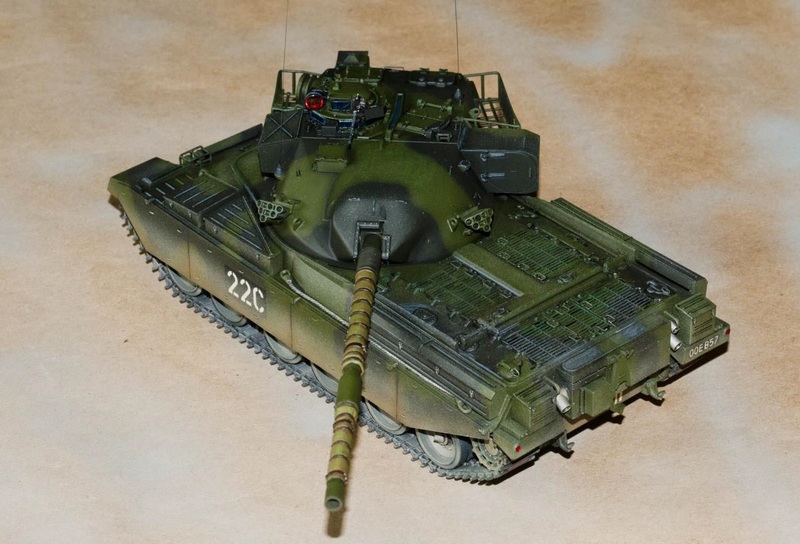 While there will soon be a newer & I assume more detailed versions by Takom, this kit is still a nice representation of this important British tank from the cold war era.